A helium-filled toy balloon has a gauge pressure of 0.200 atm and a volume of 10.0 L. How much greater is the internal energy of the helium in the balloon than it would be at zero gauge pressure? This is College Physics Answers with Shaun Dychko. The internal energy of a monoatomic ideal gas which we can assume Helium is 3 over 2 times the number of atoms of the gas times Boltzmann constant times it’s absolute temperature. 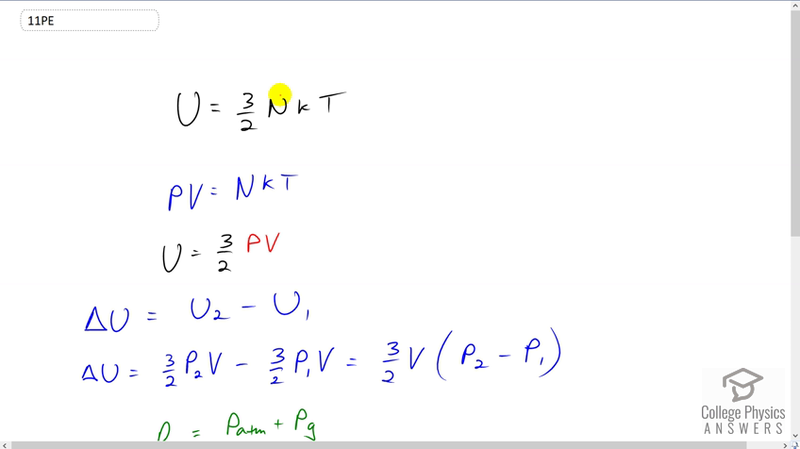 Now none of these things are known by us but what we do know, is that we can use this ideal law and replace NKT< /i> with PV< /i> instead and so this is from a different chapter of the ideal gas law. So we have an internal energy that is three over two times absolute pressure and I say absolute to distinguish it from gauge pressure they are not quite the same and we'll talk about that in a second and multiply this by volume. So the change in internal energy of this Helium balloon is gonna be the internal energy of the second state when it has 0.2 atmospheres of pressure minus the compared to the original state with no gas in there and with zero gauge pressure I shouldn’t say no gas, I should say no pressure. So zero gauge pressure is also saying the Helium Gas inside the balloon has the same pressure as atmospheric pressure. So change in internal energy then is 3 over 2 pressure two times volume minus 3 over 2 pressure one times volume and the volume factors do not get subscripts because the volume of the balloon is the same in each case we’re told and so we can factor out the three over two V< /i> and multiply by the difference in pressures. Now pressure is atmospheric pressure plus gauge pressure. This is absolute pressure is atmosphere pressure plus gauge pressure and so pressure in case two is one atmosphere plus 0.2 atmosphere which is total of 1.2 and then in the pressure P1< /i> is one point zero zero atmospheres. So now we can substitute and find our change in internal energy. It's 3 over 2 multiplied by 10 liters of volume and convert that into cubic meters by multiplying by one cubic meter for every one thousand liters and then we multiply by the difference in pressure, which is 0.2 atmospheres and then we multiply that by 1.013 times tenth to the five Newtons per square meter for every atmosphere. Converting the atmospheres into Pascal's in other words and this works out to 304 Joules is the difference in internal energy. So when there is 0.2 atmospheres of gauge pressure in the Helium balloon, it has a internal energy that’s 304 Joules higher than when there’s 0 gauge pressure.